Lesiba Ngoepe was born 14 April 1993 in Vosloorus, South Africa. He has played for Easterns, South Africa Under-19s, Titans and the Warriors. His love for cricket started out at Nageng Primary School, where he played the game in Grade 1 for the first time. Lesiba brings energy and fun into the team, some even saying he is the best dressed. In 2015, he played in the Africa T20 Cup for the Western Province. Lesiba is a batting all – rounder who made his First-Class and List-A debuts in 2010 and his T20 debut in 2013. His favourite moment on the pitch is the Warriors last gasp win against the Titans in the Sunfoil Series, and he looks up to AB De Villiers as his cricket role model. 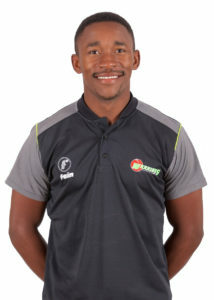 Lesiba would be in marketing, which he has a keen interest in, if he wasn’t playing cricket and he enjoys eating chesa nyama with his friends when relaxing.